The beginning of September in the Midwest means erratic weather, in the same week the thermometer can hit highs in the mid 80s F and the next day only top out in the mid 60s F or possibly even chillier. Last week we had our first really cool day, it started off rainy and ended with the sun finally coming out but the temperature still was in the low 70s F. I figured it was a perfect day to make my first batch of chili. This stew like dish is something people are really passionate about. Recipes are guarded and contain all sorts of “secret ingredients” they aren’t willing to share. I don’t know if people in other countries are as passionate about chili as we are in the States, but here there are entire cooking contests and festivals devoted to this dish. 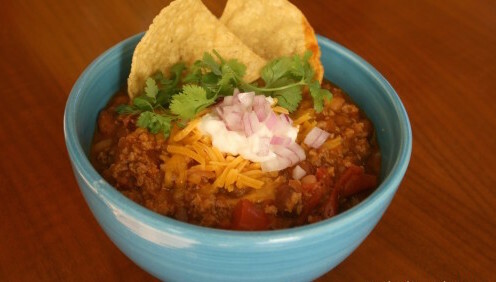 As you travel through the States you will find different chili dishes depending on the region you are visiting. A short list includes Texas chili (Red chili with no beans), Vegetarian chili, Green Chili or Chili Verde, and White Chili (made with chicken). There is debate whether chili should contain tomatoes and/or beans (I always include both). I’ve seen chili that was thick like a hearty stew and chili that was thin like a soup. It is a wonderful dish that can be conquered and made your own. I still don’t have a go to method for making chili. Over the years I have made several variations of chili that I have loved but none of them struck me as “the one”. Last winter I collected a few chili recipes from other people that I am going to try this fall in hopes that I find “the one.” Do you have that special recipe? The one recipe you would use if you were forced to compete in a chili cook-off; the recipe you would know could stand up to the other entrants? This recipe is part of my eat from the pantry challenge. Since I’ve challenged myself to not go to the grocery store and use what I have on hand I was limited to what type of ingredients I could use in this chili. Dried pinto, Great Northern, and red kidney beans where what I had in stock. All three beans worked well together in this chili. It had good flavor and wasn’t too spicy (I like a nice spicy chili but kept it mild for my daughters). We were out of ground beef so I used ground turkey instead. When I make this again I will probably use ground beef. The caramelized flavor you get with browned ground beef just isn’t there when you substitute ground turkey. All in all this was a good chili recipe that got me excited about the crisp fall air that is soon to come. Hey veggie friends, have you used TVP in chili before? This chili is a thick stew like chili if you like something thinner add more tomato sauce or V8. Sort beans looking for any rocks or dirt clumps then rinse beans. Put all ingredients in a large pot add water until the water is 1 inch above the beans, place lid slightly ajar. Bring to boil. Let beans boil until done --this took a couple hours since I didn't presoak the beans first. Make sure to watch the water level adding more hot water as necessary making sure the beans don't boil dry. Boil beans until they are tender and done to your likeness. In a large pot over medium heat add oil, turkey, onion, and salt & pepper brown turkey meat until no longer pink. Add tomatoes, V8, tomato sauce, beans, liquid smoke, and the spices. Stir to combine. Heat through. Taste and adjust seasonings accordingly. Serve immediately or let simmer at low heat until ready to eat. For extra heat add diced jalapeno when browning the turkey. I added sour cream, cheddar cheese, raw diced red onion, cilantro, and tortilla chips to my chili when I was ready to eat. Personalize your chili with your favorite toppings. Enjoy! We love chili at this household. I like most chilis Ive tried unless they have large chunks of veggies or sugar in them. Chili looks great! I didn’t see on your blog where I could subscribe. I live in Southeast Iowa. Just started blogging myself. I will be trying some of the recipes. Thanks for posting.